It has been a WEEK. Last Friday was Arts Everywhere Day at UNC, a celebration of arts across campus, that involved tons of public art and pop-up performances. 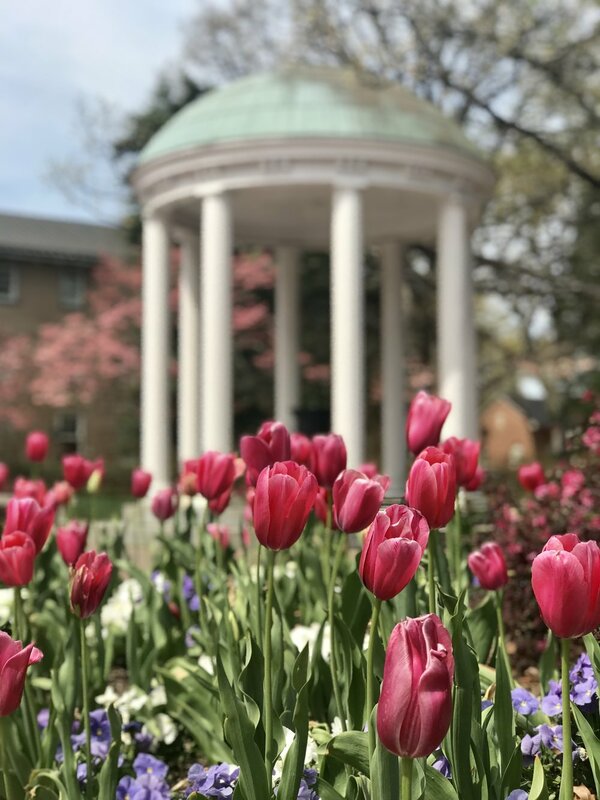 Tuesday was GiveUNC, the university's first full-scale giving day; we raised over $1.5 million online in one day and I was on campus for about 17 hours. Two really phenomenal, inspiring, busy days at work. I tried to lay low the rest of the week to conserve energy (except that whole 90-minute Orangetheory workout I did on Sunday. That was the opposite of laying low.). I've had The Selection on my to-read list since a blogger I love (Grace at The Stripe) recommended it. Well, I've finished book one, and I am very upset that I didn't get them all at the same time from the library. I'm so deep into this slightly (very) ridiculous series. It's basically Hunger Games meets The Bachelor (except no one has died in the competition, which is kind of a bummer). The first three books span this competition called The Selection, where a girl from each province is nominated to compete for the prince of Illea's heart. Illea is basically North America, a combined Canada/US/Mexico/some central American countries. It's dystopian YA, so over-the-top, and so fun, and I'm going to need the Durham Public Library to get me off the waitlist for The Elite and The One ASAP. All of the reading I'm doing (I also finished Me Before You over the weekend) means that I've been watching less TV lately. The one thing my roommate and I tune into almost every night is Shark Tank. It's an easy and mindless way to end the evening, and I've basically become an expert in entrepreneurship now (you know, the same way watching Law & Order made me an attorney and watching Grey's Anatomy made me a surgeon). I used to make a new Spotify playlist with songs I was loving every single month. It's a habit that I completely dropped when I started teaching cycle, because I was making new playlists every week for class and that's just where I kept all the music I loved. Well, I've missed those playlists and decided to start them back up again — but at a more manageable pace. I'm going to do four a year. Here's Spring 2018! I had buffalo chicken pizza twice this week. From two different establishments. Voluntarily. And let me tell you, it was absolutely fantastic both times. I used to avoid buffalo chicken like the plague until we had it over and over (and over) again during the 2016 primary debates. Now I'm low-key obsessed. Remember those buffalo chicken meatballs that I loved during Whole30? Still making them all the time! Beating Manchester City in the Champions League (!!!! ), paying with foil balloons, walking with a friend's corgi, catching up with friends over FaceTime, crushing a 90-minute Orangetheory workout, posting a tweet that I 100% for sure know led to someone making a gift to my favorite scholarship at UNC.